Cancun Cosmetic Dentistry Review – We will recommend to our friends! Hello again! 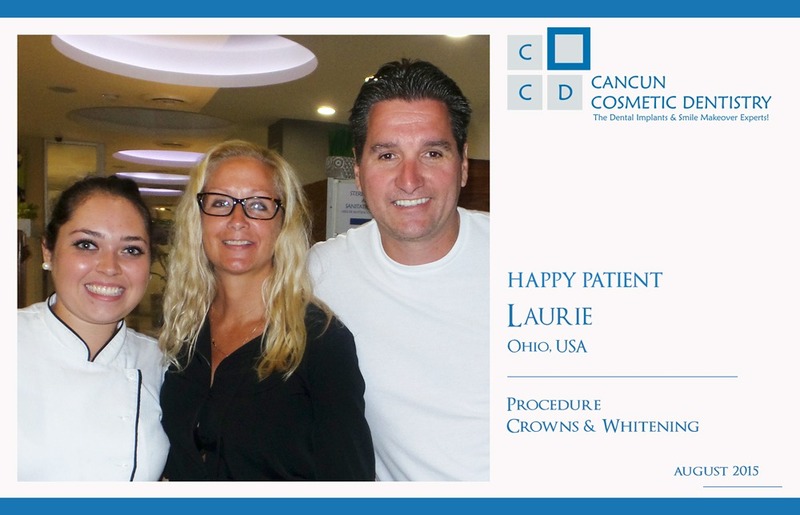 Today we wan’t to thank the visit of our dear patient Laurie who came from Ohio to get crowns and whitening. Laurie found out about Cancun Cosmetic Dentistry‘s services on the internet like many other of our patients. She decided to come for vacation to Cancun and take advantage of the amazing savings available to improve her smile. General Dentistry on USA can rack up to several thousand dollars and believe it or not it can easily bankrupt entire families. We talked about this in this blog post. If you have the need of doing something with your teeth, make an appointment with us and plan your vacations accordingly. Your crown isn’t noticeable. The crown will be made to match your other teeth exactly. The shade of the neighboring teeth will be recorded, to make sure that the colour looks ‘core’ is then prepared in the same way as a natural tooth and the impressions are taken. Everyone was so nice and courteous, we will recommend CCD to our friends. Thank you so much for trusting your dental health in our hands Laurie! We always do our best to make our patients feel comfortable and are with them on every step of their procedure. We will solve your questions and make you feel at home. Laurie is pictured above with her husband and our Mexican dentist Rebecca Llamosas. You can also get a new white smile with the professional assistance of our doctors. If you want to know more about our services call toll free from USA and Canada 1-800-565-1424, or if you are already on vacation in Cancun and want to meet us, you can call us for an appointment at the following local number (998) 1-40-51-25. Eating a snicker with implant dentures! British Happy Patient found affordable dental crowns! Animals with Teeth Super Powers!? ANOTHER Cancun Cosmetic Dentistry Happy Patient Review!